Another week, another V8 - and pop up headlamps! Let's imagine that you've just invented a car-based time machine with a range of about 30 years and you're deciding where to mount it. Obviously you're not going to fall for the horrendous cliché of using a Delorean, or saying "Doc" at the end of every sentence. But you need something that is going to feel modern and comfortable yet be unobtrusive and passably cool in any year you choose to send it back (or forward) to. In this admittedly unlikely scenario, the BMW 8-Series has to be the perfect car. Regular readers may well be detecting certain trends in the cars that have featured here so far. To date every one of them has been powered by some form of petrol-fired V8, a commendable tradition that is going to continue for at least one more week with this attractively priced 840Ci. 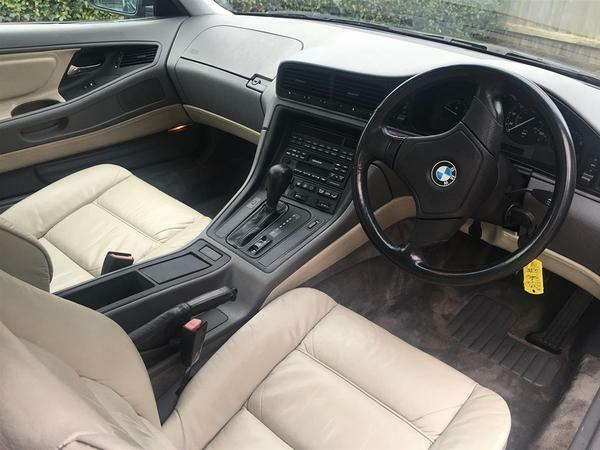 The E31 8-Series is one of those cars that struggled to make its case when new, but which has aged considerably better than German wine. First shown at the Frankfurt motor show as long ago as 1989 the 8 was intended to sit atop the range, carrying a substantial premium over even a fully laden 7-Series. But it was also heavy, complicated and, according to contemporary road testers, disappointingly numb when compared to the precision common to the rest of that era's Beemers. Yet the years have been remarkably kind to the big BMW; can you nominate anything else from the era that still looks so fresh? Styling was strongly influenced by both the pioneering use of Computer Aided Design but also the brief to deliver aerodynamics slippery enough for proper high-speed work. The result was a wind-cheating CoD of just 0.29, and the same logic also led to the always-right decision to give the 8-Series pop-up headlamps. At launch the only engine available was a 5.0-litre V12 which pitted 296hp against the 850i's then-porky 1790kg kerbweight, and which also came with the choice of both manual and automatic gearboxes. It was a technical showcase with features including BMW's first use of stability control and a cabin packed with what were then novel gizmos, including dual zone climate (with rotary controllers), an auto dimming rear mirror and an onboard trip computer which took up as much space as the DIN-sized audio head unit. It was also one of the first cars to get (or indeed to require) a 155mph speed limiter. After plateauing barely above banger-racing territory in the mid-noughties the values of 850s have been rising steadily for years. These days even non-runners are being offered for over £20K. 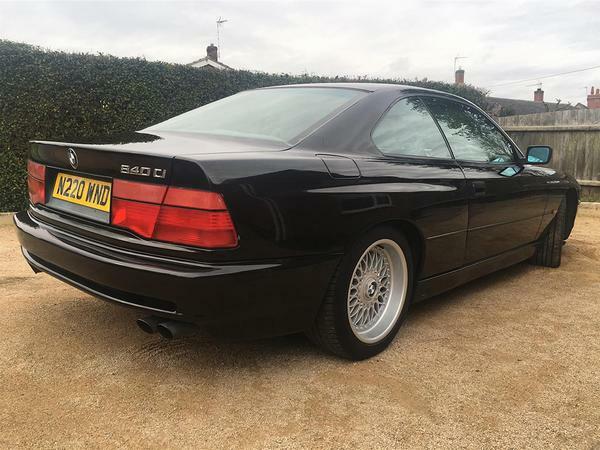 If you want a nice example of the brawnier 5.6-litre 850 CSI which followed in 1993- with 380hp - you'll be paying nearly as much as you would for a brand new G15 8-Series. Which is where the 840Ci comes in. In the UK this pretty much replaced the 850, with minimal overlap between the V8's arrival in 1993 and the V12's withdrawal the following year. Early 840Cis (like this one) used BMW's M60 engine and produced 282hp - nearly as much as the 850i. Late in 1995 this was switched for the 4.4-litre M62, but badging and power output remained the same. The M60 engine is the one that infamously suffered from premature wear of its Nikasil coated cylinder liners, but cars that suffered from problems will almost certainly have had them sorted when still young, up to and including new blocks fitted under warranty. Having arrived just in time for a savage global recession, the 8 Series enjoyed only modest success. Only 30,600 were produced for all global markets during a nine year lifespan, with the majority of those being 850is sold in the 'States. Just under 3000 cars came to the UK, with around two thirds of those being 840Cis. How Many Left reckons that around 1000 E31s are still on the road with a similar number SORNed, similar numbers to the considerably older Porsche 928. When new the 8 was a seriously expensive car. Back in 1995 this week's Pill had a list price of £54,490 before options - just £505 less than a 911 Carrera and two grand more than the quicker and more practical E34 M5. 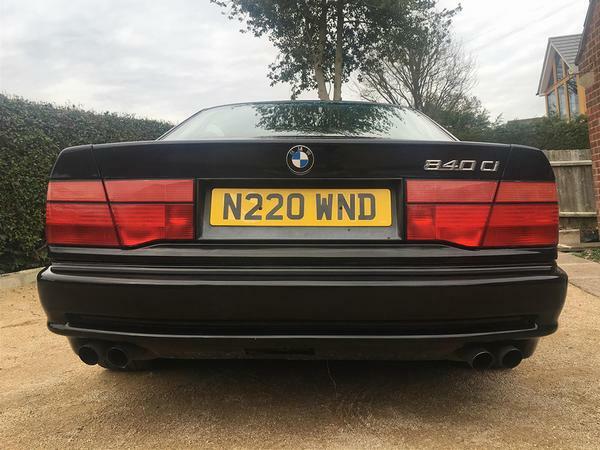 Not that they all sold for that; I know somebody who started working for BMW as an exec in the late 1990s and - to his considerable surprise - was offered an 840Ci as his company car in place of the mid-ranking 5-Series he was expecting. Obviously he said yes, and soon discovered the reason for the upgrade - the 8 was a cancelled order in bright yellow. He got to drive it for six months until it had depreciated enough to have any hope of finding a buyer. 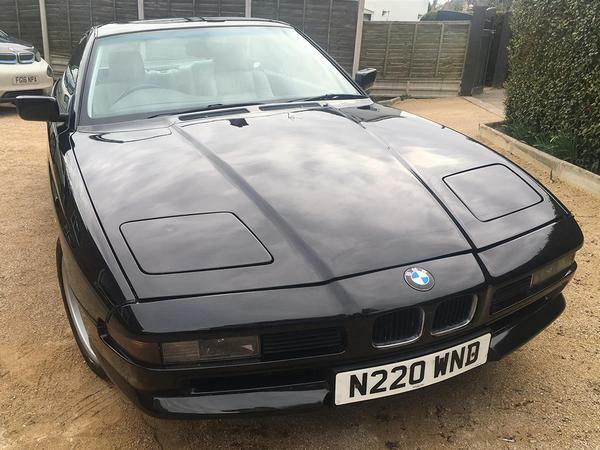 While the V12 is obviously the more exciting option the 840Ci is still acceptably brisk, with a mid-7s 0-60mph time when driving through the five-speed autobox of this car - the manual 840 was very rare and the option was discontinued with the shift to the 4.4-litre engine. It's still on the touring side of sporty, with a subdued soundtrack on the standard exhaust. But the increase in flab and reduction in feedback endemic of more modern equivalents will have acted to sharpen the 8's dynamic experience in relative terms. The V8 can also be tickled to deliver economy numbers starting with a '2', something much harder with the V12. While running costs aren't exactly supermini sized a used 8-Series has always been less brave than its reputation suggested. It does have more tech than was normal for the era, but nothing compared to more modern cars and the electrics tend to give little trouble. The big issue is limited availability and high cost for rarer parts, especially trim, with the vendor of our Pill admitting to having failed to track down a control module for the non-functioning power sunroof. Beneath the bonnet, pretty all of the oily bits are shared with the contemporary 7-Series, making it easier to keep in fettle. E31s can rust, especially around the rear arches, but the seller promises that this one is clean. The MOT history suggests some gaps in usage, but also reports on nothing more scary than a predictable appetite for consumables. That will continue. On the plus side, the car's interior has been retrimmed and the parchment hide looks good in the pictures. While 140,000 miles might be high by the rarefied standards of luxury tourers, it's still an average of under 6000 a year and there seems little reason careful ownership couldn't add appreciably to that total. It would be churlish to argue anyway - this isn't just the cheapest 8-Series on PH, it's the cheapest we can find anywhere in the UK. Time to head back to the future? Wonder if the yellow one mentioned is CRA1G’s off here? Can’t be many Dakar Yellow ones about. There’s a good Wheeler Dealer’s episode on YT where they do their thing on an 840. Well worth a watch, one of the better ones. When new these had such presence and seemed really wide and low. I saw one recently and perhaps not surprisingly it looked quite petite. Not small, just delicate. Still an eye catching thing. That looks great for the cash. I had a 1998 840 sport for 90,000 miles. I LOVED that car. I'd find myself smiling at it as I walked towards it. It was fabulous to drive as a GT and a real head turner. I averaged 18mpg but if I switched off the aircon and had the radio on really low I cold get 22!! However, living in Clitheroe with easy access to the Yorkshire dales with wide open long curves I’d get 12mpg. Wish I’d had the money to keep mine, got £10k for it ten years ago. Can I just say, bravo to the vendor for that advert. That is exactly the type of person I'd want to buy a car from and if I was in the market I'd be after that without hesitation. Apart from the normal family car they also have an E36 M3 and an Estoril Blue 840; just gotta love a family like that! Still, pop-up headlights, a sonorous V8 and a rear like Kim Kardashian’s; what’s not to like? Can't see why it would require a brave pill though. Probably a very sound place to put some money if you keep it as a weekend car. Can't see it losing any money. Used to work on an Alpina V12 for a customer. Everything was different. And usually unobtainable. Hatefull thing to drive too. It used to break on a weekly basis. Usually electrical. Gawd, my P38 is more reliable!